I am thrilled to be a part of the blog tour announcing the release of Danyelle Leafly’s THE FAIRY GODMOTHER DILEMMA! I’ve had the honor of reading the first three chapters and I can promise you, the story is full of action, memorable characters, giggles, and magic. And I love how Danyelle is releasing her book as a serial novel. It’s like opening a little package every week when the installments are released! To celebrate Danyelle’s book release, she has kindly offered to stop by and chat with us. The telling of THE FAIRY GODMOTHER DILEMMA alternates between four characters. What were your biggest challenges in writing through the eyes of so many characters? My biggest challenge has been getting them to talk when they were supposed to, and getting them to be quiet otherwise. Two of them have a hard time taking orders, and it’s a bit unnerving to feel them boring holes of disapproval into my brain while I write. What inspired you to try out this innovative means of publishing your novel? I had considered doing something along these lines for a while now, but wasn’t sure how to do it. I was also a little worried about identity theft—my characters’, not mine—so I knew that I needed a platform that would make the story available to readers without having it too open. I ran into Tracy Hickman at Caped CONduit earlier this year, and learned that he had just finished up with his first serial novel (he and his wife co-authored it) and was starting on the second book. I was intrigued when I learned a little more about how he’d set it up, and excited when I found out that he had an online course that detailed how his method worked and how to get everything set up. His scope reached far beyond what I had been considering, and I’m definitely glad I went with it. Generally speaking, Nerissa’s journal entries (Fairy Notes) are released on the blog portion of my website every Wednesday. Or, if you subscribe to the email list, they’re delivered to your inbox instead. Once THE FAIRY GODMOTHER’S DILEMMA is finished, edited, and formatted, I’m planning on including the Compendium and Fairy Notes as extras at the end of the ebook. I love how your website is interactive with your readers. You have an Are You My Fairy Godmother board, extras such as the Compendium of Fairy Godmothering Terms, and Fairy Notes. Thanks! My idea for this—branching off of Tracy’s method—was to make my website as interactive as possible. The extras are a lot of fun to do, and I think they work to bridge the time in between chapter releases. I also liked the idea of being able to chat and get to know my readers better through the comments as well as the forums. Some of the forums are hidden, but are fully accessible once you register. One of the forums deals with the story (so if that squid showing up in chapter twenty, for example, makes you wonder if my work space is ventilated well enough, you can say something :p). Another forum deals with general writing (anyone can get feedback on their own pieces), and the last deals with books (this is the place where you can share what you’re reading or spread the word about awesome books you’re reading). Now that I’ve read your first three chapters, I’m hooked! But I also can’t wait for the ebook and hardcover. When will those be released? 2. #1 country you’d like to visit: Embarrassing confession: I’d *love* to visit Scotland just so I could listen to people talk. Also, I hear it’s a beautiful country. O:) I’d also like to visit Japan one day. 3. Favorite mode of transportation: Pumpkin coach and a good book. 4. Preferred writing method: Definitely computer! Thank you so much Danyelle for chatting with us!Now that you’ve heard from Danyelle, you can see what an amazingly creative author she is. 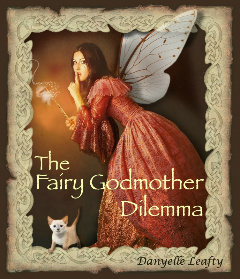 In celebration of THE FAIRY GODMOTHER DILEMMA, I am giving out a subscription! Just post a comment to enter. I hadn’t heard of serial novels before, but it sounds interesting! It’s a great idea to get the readers involved, too. Such a creative way to get the book out! I hope that you sell plenty of subscriptions, Danyelle. BTW, I know EXACTLY what you mean about writing from more than one perspective. I write from five and three of the characters are very vocal. One of them can distract me just by sulking. Wow! I registered, but I haven’t checked out the forums. I guess I better get on that. How fun! Jenna- yes, it really is a great way to get writers involved. After I read books sometimes I don’t want to leave that character’s world and what better way to do that! Misha- It is a creative way to publish your work. I’m so impressed with Danyelle’s ideas and bringing her story to life. And yes Kim- it’s the greatest cover isn’t it? I’d also love to visit Scotland. I need to register or something, or maybe read Danyelle’s entire ebook when it comes out (hope it’s soon). Thanks, Misha! Yes, characters can be awfully bossy at times. >.< Thanks, Kim! Thanks, Medeia! 😀 The ebook won’t be available until November–shortly after the subscription ends. 😀 And thanks to all of you for your kind comments! I haven’t started reading it yet, but I like saving up chapters so I have a big chunk to go through all at once. Definitely need to check out the forums though! Very interesting! I don’t know anyone doing this and I’m intrigued. Fantastic interview, and how creative! The novel sounds amazing and I wish Danyelle every success.